Obviously, this shade of orange has a very high visibility, therefore, it can be a tad intimidating for many people. 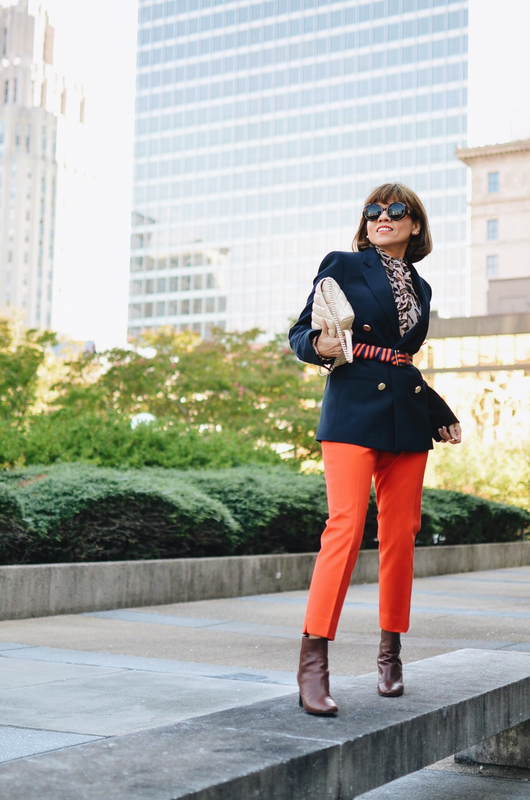 To me, orange is a color that dictates energy and confidence, so I most definitely like to have some orange pieces in my wardrobe. The color orange happens to be a popular color around this time of the year because it's often related with Autumn leaves, pumpkins, and Halloween. If you're afraid of wearing orange (including at the office) for fear of people associating your look with Halloween, then I suggest wearing it with any color but black. I personally don't mind at all wearing it with black, in fact, I think it's a strong and yet fun combination. 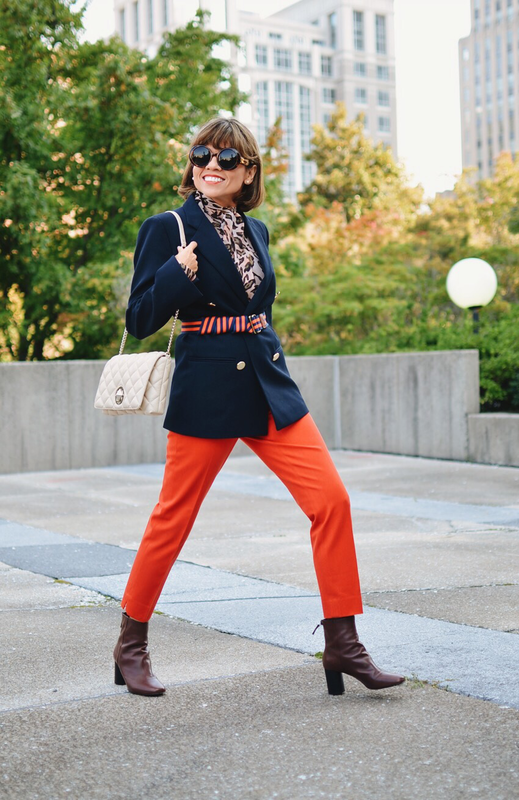 In my today's outfit, I decided to wear my bright orange pants with brown, beige and navy, which are perfect neutral colors to compliment a flamboyant shade of orange. As you can see, the fun didn't stop with the orange pants. I also managed to add a striped belt that matched the pants and blazer and also a leopard print that pretty much bonded all the pieces together. 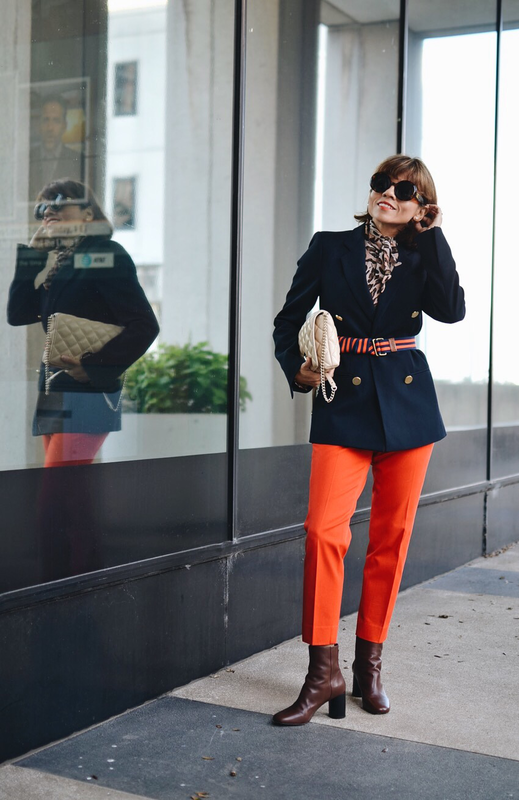 This look, so far, is the most vibrant from my "Monday Work Outfit" but it was created for the women that love to wear colorful pieces to work. 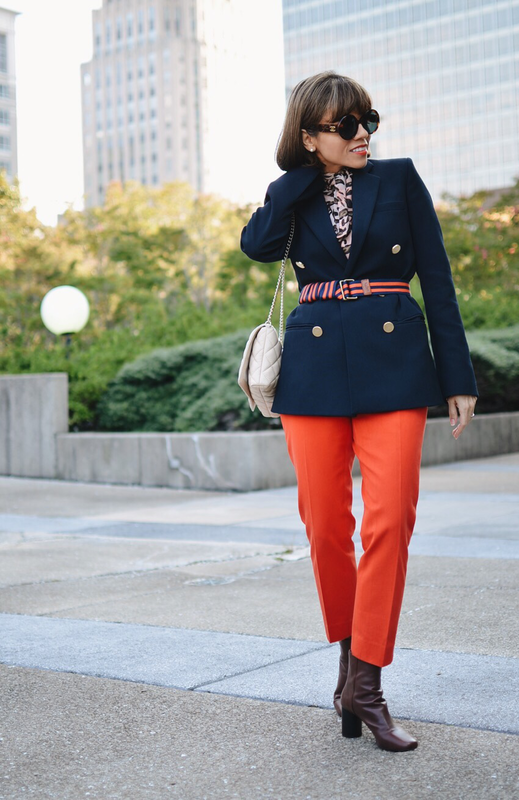 If you're not fond of wearing color and mixing patterns at the same time, you can always recreate this look by wearing a solid colored top and/or belt. Blazer: Zara. Similar/Blouse: Helene Berman. Similar/Pants: Banana Republic. Similar/Boots: Sandro Paris/Bag: Kate Spade. Similar/Belt: Ralph Lauren. Similar/Sunglasses: Chanel. Similar/Earrings: The Pearl Source. Similar.